Yellow peril socks obnoxious oxen for six. Gnats fly. Flies flee. Fights and fisticuffs floored by flower. The Yellow Pimpernel strikes again – up The Primrose Path. OK. It isn’t really called Yellow LooseLife – it’s actually Yellow Loosestrife and it’s another one of those plants that are one variety if it has spots on the leaves and a different one if it has minute bunches of hairs – and loads of other stuff that only a pedant or a botanist could really care about. It has probably escaped from somebody’s garden recently (speaking geologically) and naturalised itself in the ditch along the top road. Mrs. Grieve in her Modern Herbal  notes that it belongs to the same family as the primrose and the pimpernel. She also says the the name Loosestrife is a very old name and that it used to be believed that it would quieten fighting or restless oxen. She notes that the plant appears to be obnoxious to flies and gnats and, no doubt, placing some under their yokes would reduce that irritation. Burning the dried herb in houses would drive out all the flies and gnats too, so it was very useful in marshy areas. 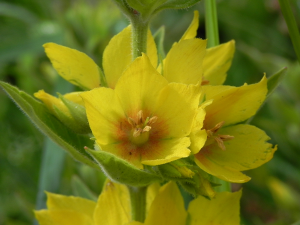 So, as you plough life’s furrow, if your team of oxen become restless, Yellow Loosestrife might just do the trick – it’s worth a try.